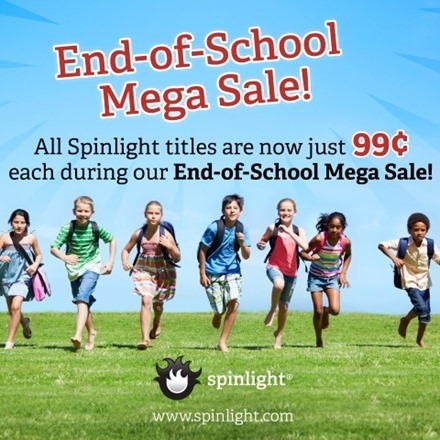 Spinlight’s End-of School Mega Sale has all of their educational games for iPad and iPhone on sale for just 99 cents. I posted just a few days ago about the excellent Geography Drive USA app that’s a part of this sale. Spinlight makes a number of other popular and award-winning iPad apps for kids from ages 1-12+. And now they’ve got all of these on sale at 99 cents, down up to 75% on some of the titles. … And second, we’re doing it for a reason. We want to make great apps for kids — and to make them insanely affordable for kids, parents and schools. But to do that, we have to see the volume it takes to be profitable at a lower price point. So we’re conducting a big experiment to see how low we can go. And we’re inviting you along for the ride. I’d say that’s a heck of a win-win situation for parents and teachers – the opportunity to grab up some excellent educational iPad games at bargain prices and a t the same time give some support to a publisher that’s focused on producing these sort of apps. The sale runs until May 12 and you can check out all the apps and bargains at the Spinlight home page.